Chart4.NET 2015 Version 5.1 is released. Different views of the chart is now supported: Dynamic, Three-Dimensional and Planer views. Also, extended search and navigation facilities are there. Still better support for large organization charts - smooth scroll and zoom. Navigational tree for better viewing the sub-charts of large charts. Dynamic View that has expand/collapse, hyperlink, focus, node-click events etc. 3D View for sub-charts (large organization charts). Planer View for sub-charts (large organization charts). Search for node data, and quick navigation to that nodes. If chart control is set to Extended View, there are Dynamic, Three-Dimensional and Planer views available as radio options (left-bottom side). Call hmSetViewExtended method, to show the chart cotrol in extended mode, to show/hide the available views, to set the default view, and to show/hide the navigation tree. Call hmSetViewNormal, to switch back to simple view of the chart. To change currently displayed view, dynamically from code, set hpChartView property to Simple/Dynamic/Planer/ThreeD. Click on a node group to see it's sub-chart on the RHS. Right-click a sub-chart to see it enlarged. See https://www.youtube.com/user/Chart4NET for video tutorials. 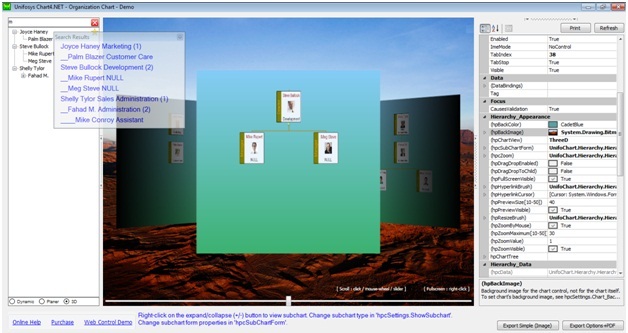 Type within the top-left text box (in extended view) to search for organization chart nodes. Click on the results to navigate to the node. (Be in dynamic view to see the leaf nodes (if it is), on the RHS).